I made a 'big' shopping trip on Monday to Fred Meyer. We were out of cream & bananas. I hadn't looked at the ad but was happy to see a great sale! I spent $21.77 on all this. Cheese was $0.99 for 8oz, eggs were $0.99 for 18, yogurt was $0.33, sour cream was $1.25, mangoes were $1.00, and I found apples & bananas on clearance. I also found Kerrygold cheese for $2.05 and it was a delicious late night snack for mama 4 nights this week. That great sale only lasted through Wednesday so I went back for more cheese and mangoes on Wednesday. 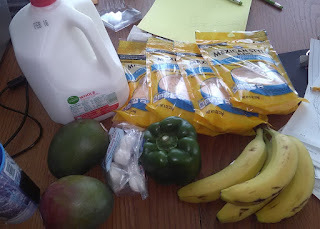 I also bought organic milk, bananas, a green bell pepper ($1.25 for organic), and some fresh mozzarella on clearance. Yummo. I spent $16.62. DH ran out to the store Saturday night for milk & coffee creamer. He spent $8.98.